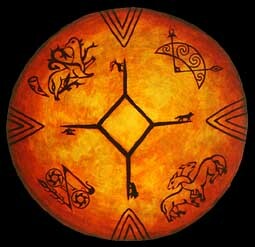 The sacred drum was so heavily persecuted in Europe during the Christian era that it disappeared from large areas. The hand drum survived mainly at the continent's peripheries, in Saameland, Ireland, Sicily, and southern Italy. Painted in honor of the pagan ways of northern Europe. At the center, a Saami emblem of the sun and cardinal directions; a bird in the east, a reindeer (Saami symbol of the sun) in the south, a wolf in the west, and a bear in the north. In the southeast and northwest, Russian images from old Ryazan, a city famous for its pagan faith as late as the 14th century. In the northeast and southwest, symbols from the richly carved Pictish stones of 7th-century Scotland.